Ministry of Propaganda - 12/Mar/2006: "Weekend Baking"
Last weekend I mentioned I was planning to bake something from the Baker's Tale by Catherine Brown and James Burgess. Well, I did and it didn't turn out a complete disaster, meaning I can blog about it. First the solid ingredients went into the bowl and were mixed together, soon followed by the liquid ingredients. Then it was time to knead, using the electric mixer first. The first moment of truth had arrived, would the dough rise? I left the dough for a while and when I came back it had doubled in size. So far so good. It was stickier than expected and I struggled to form it into the rolls I had decided to make, but after a while I had them in roughly the shape I wanted. Then a slight problem: I realised I had no brush or anything like it to apply the beaten egg to glaze them, in the end I carefully poured the egg over the rolls. Finally they went into the oven. They turned out quite nice, bigger than I had planned though. They are more like small breads then large rolls. 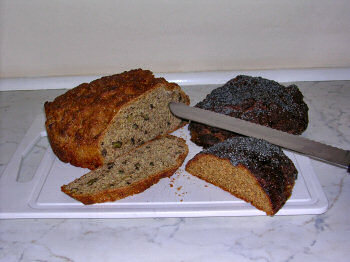 Either way, it tastes very nice as does the soda bread with walnuts. May be not next weekend, but I'll certainly give it another go, next time I'll probably bake it as a bread loaf.